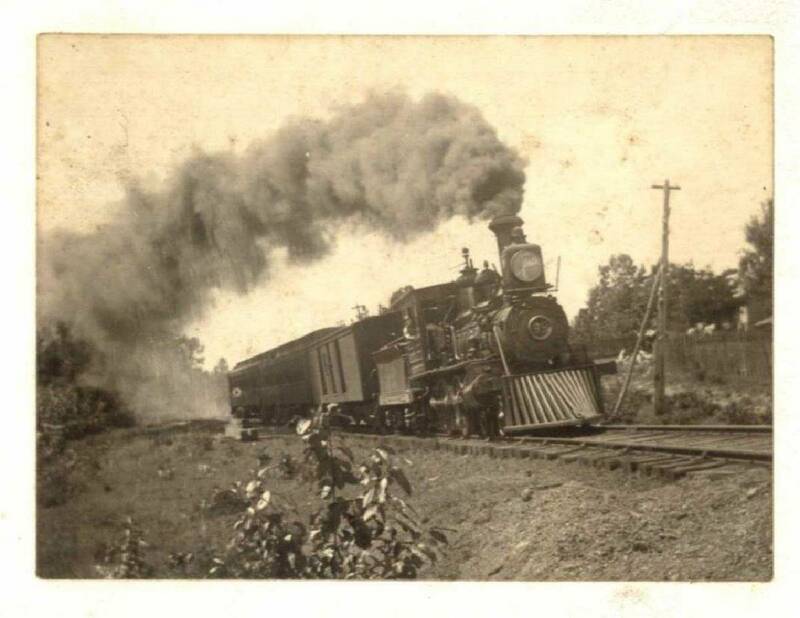 When the tracks of the Mountain Goat Railroad were pulled up in 1985, only a few hard-core railroaders and former University of the South students remembered the history of the unique 40-mile short line spur that carried coal and people in Tennessee from Cowan to Sewanee and Palmer beginning in the 1850s. Today the Mountain Goat Alliance is creating a paved hiking trail along the entire railbed. The history of the Mountain Goat begins in 1845, when young Thomas Wooten chased a groundhog from a field of corn in Grundy County up the side of a hill into a sourwood stump. The boy unearthed a black substance that he showed to his father, Benjamin, who recognized the substance as coal and began selling small amounts of it to blacksmiths in the valley near Winchester. In 1850 a young Irish immigrant, Leslie Kennedy, found outcrops of coal while hiking a few miles away on the Cumberland Plateau and encouraged Nashville attorney William N. Bilboa to look at his discovery. The attorney was impressed and bought lands on the plateau. After traveling to New York City, he interested Samuel Franklin Tracy and other venture capitalists in purchasing Bilboa's holdings for $50,000. The new owners formed the Sewanee Mining Co., named after the local bituminous coal seam. Meanwhile a railroad linking Nashville to Chattanooga had reached the base of the plateau below Sewanee where a tunnel was being dug to avoid the severe climb over Monteagle Mountain. (At its completion, the tunnel was recognized as one of the longest in the world and an engineering marvel.) Major A.E. Barney, a civil engineer, developed the idea of a rail line connecting at the bridge at the north entrance of the tunnel and climbing the eight-mile, 800-foot mountainside at 100 feet per mile. The 2 percent grade, then the steepest railroad in the world, had tracks designed to allow locomotives to drag 15 to 18 empty cars up the grade and control the same number of loaded cars on the way down. The branch line, first named The Goat Road and later The Mountain Goat, reached the lower coal bank in the Midway-St. Andrews's vicinity in 1855. In 1858, the Sewanee Mining Co. offered the bishops of the Southern Dioceses of the Protestant Episcopal Church 5,000 acres of uneconomical coal land plus a million board feet of lumber, free transportation of materials for 10 years and 20,000 tons of coal. Other land owners offered additional acreage. These inducements along with the Mountain Goat's rail access convinced the bishops, led by former Confederate Gen. Leonidas Polk ("Sewanee's Fighting Bishop"), to locate The University of the South at the mountain site. The 1932 book, "Sewanee," written by a group of local citizens, gave stated schedules of the railroad's service, but waits of two-to-five hours sometimes occurred at the Cowan depot. The train frequently ran off the tracks due to the sharp curves. A small passenger caboose was occasionally attached to the train, but riders usually had to ride on the top of the coal cars. Ladies perched on loaded coal cars raised their umbrellas when it rained. At the final passenger run of the Mountain Goat in the fall of 1971, local citizens, Sewanee students and clergy gathered to commemorate the long and colorful life of the little spur line. The band played the Sewanee alma mater, the national anthem and a funeral dirge as two cabooses filled to capacity disembarked at the Sewanee depot. The tracks and trains are gone, but the route of the Mountain Goat is being recreated in a 10-foot wide paved walking trail extending through the seven towns that were the original part of the Cowen-to-Palmer railroad line. Segments of the trail from Sewanee east to Monteagle are already complete. Hikers will no longer hear train whistles on this trail but can use their imaginations to recall the life of the little railroad. Those wanting to see photos and memorabilia can peruse "The Mountain Goat," a 124-page history by J.W. Arbuckle and Alan C. School. Others will enjoy "Dad's Railroad: The Mountain Goat," written by Mary Patten Priestly and beautifully illustrated by Jack Baggentoss, which tells a fictionalized story through the eyes of a 10-year-old of a father's experience as a brakeman on the little short-line railroad. Jerry Summers is an attorney with Summers, Rufolo and Rodgers. Frank "Mickey" Robbins is an investment adviser with Patten and Patten. For more, visit chattahistoricalassoc.org.